Memories are often made of realities one wished never happened, such as futile wars. In the 60ties, as awareness of many things - racism, value of women, uses of propaganda, causes of wars more political than for self-preservation, believing in deceptive leaders. I knew early in my years that something was wrong with this world. As a “hippie”, I tried to shout out with other youth to protest senseless issues, although I was just one in a crowd not aware of the power of voice but at least speaking up. Sometimes it was just beating our heads against the flag pole. Sometimes it was sitting in a circle looking for “love, peace, happiness” of what were tagged as “flower children”. But at least it was a try. Since the Vietnam War was the bullet for these issues, I had always wanted one day to see truths of what broke our hearts and spirits. I think all over the world, most people wanted the same thing: peace and ability to leave a normal, hard working life. After many wars and many endings, we still seem to have no control over being in the wrong place at the wrong time and having to react to danger and drama. At night here in Vietnam, when it is your day, I watch on CNN the stories that still trash all that we hope we can be. Yesterday, a two hour weaving between motorcycles and mo-peds to Cu Chi Tunnels, called the “holy revolutionary base of Military Region Committee Saigon-Gia Dinh High Command of Cu Chi District Party Committee and its people”, was a learning experience. 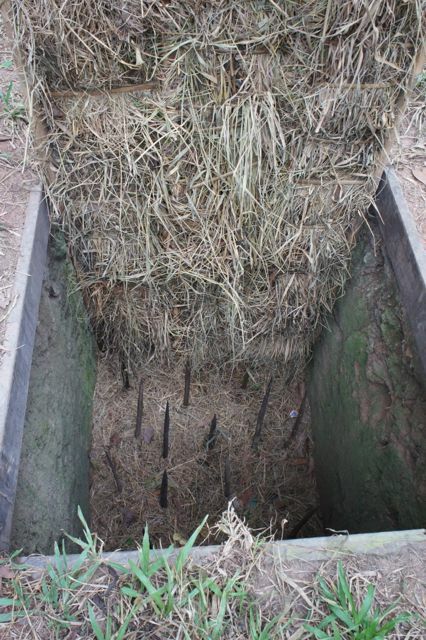 Located in the Mango Forest are remnants of more than 200 kilometers of underground tunnels large enough to be a safe city for hundreds of military and Viet Cong. 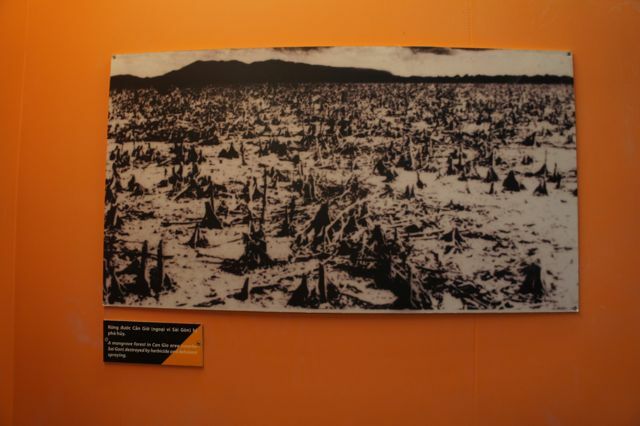 It is said to have been “the most bombed, shelled, gassed, defoliated and generally devastated area in the history of warfare.” It took 30,000 bombs to destroy it. This underground city built in 1966 was the stronghold of the VietCong (Communists from the North) about 40 miles outside Saigon (which was not bombed) where the guerrillas played cat and mouse with US and French forces. The caves, dug by hand and crude tool, could sustain the weight of a 50 ton tank or destructive bombs. There were sleeping quarters, medical stations, large meeting rooms and “performance halls” in the curving narrow paths. Soldiers could enter through camouflaged narrow holes that I could not have slid through. 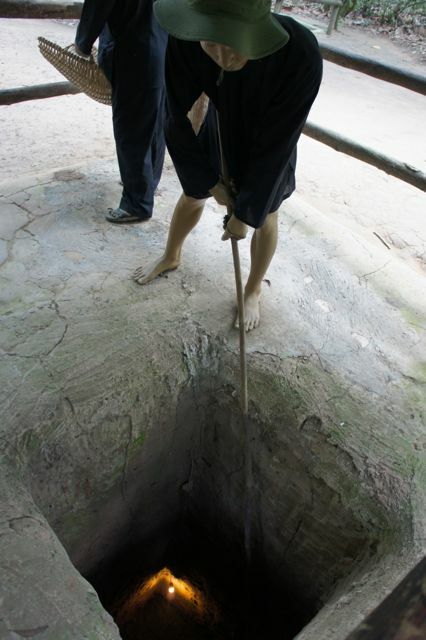 The Cu Chi Tunnels had access to the Saigon River where people could cross to Binh Duong Province. There were up to four layers or levels - like something ants build in miniature - and block points to obstruct an enemy or stop toxic chemicals. It was a city and women, children, old people also were able to survive attacks inside the hard dirt walls. But it was Napalm and Agent Orange defoliant that turned the jungle into a moonscape. Today, trees have returned but the feel of those moments of escape and reclusiveness is still there. I would not go down under, not liking caves or tunnels. Our guide explained the US “GI” force was able to destroy the tunnels in five ways: by water to flood it, by underground “army rats” who crawled into the small holes - had to be small people - to plant bombs; German Shepherd dogs - over 2000 - who would be given a piece of Viet Cong uniform, and then would take off in a sniff; (the VC would respond with chili peppers, which would ruin the dogs, who would sneeze, but then the GIs would know the VC were present; by using a bulldozer; and finally fresh grass: if grass grows, and someone walks through it, he leaves a track. 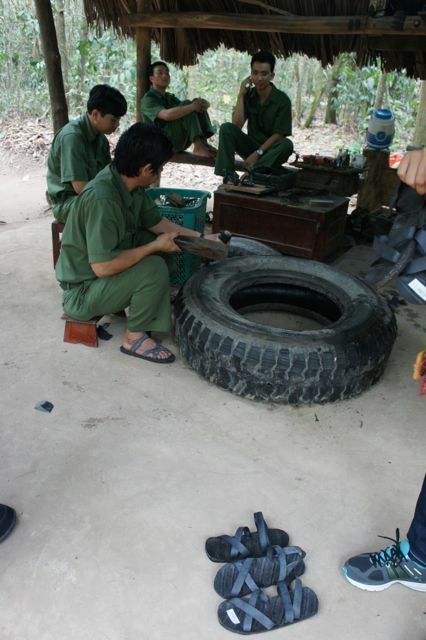 Viet Cong also made rubber sandals (rubber is the 2nd largest export in Vietnam) the bottoms of which were made backwards so the GIs wouldn’t know which way the soldiers trekked in the grass or dirt. In the scorched earth policy, the jungle outside and along the Ho Chi Minh trail was destroyed by napalm, flame throwers, water, smoke bombs and gas, as poisonous cobras were stuffed through bamboo pipes to poison the VC (though the VC ate cobra to get stronger.) 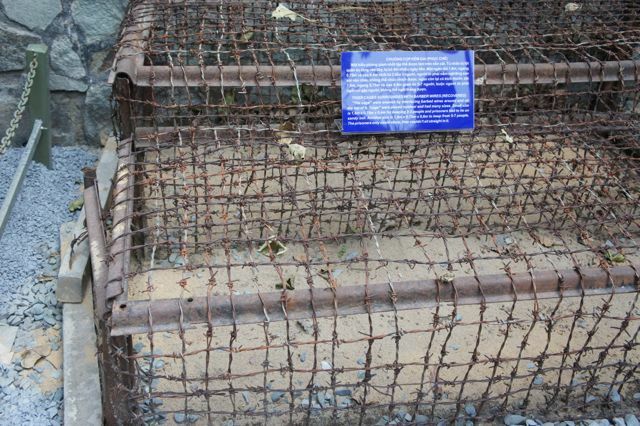 Today a “park” preserves the community through which tourist walk to see and experience various examples of booby traps, hidden entrances, and the enormity of the place. Then at a way station, brave tourists have a chance to fire some of the enormous weapons used in the war, while the gun-shy can have pandana leaf tea and cassava to dip in a peanut,salt,sugar blend. In complete contrast to that army green, dirt and jungle experience, was another hour and a half away in Tay Ninh. 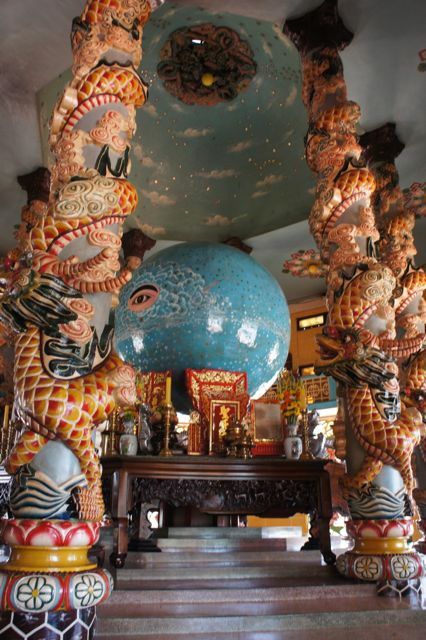 A strange ornate church looking like a Michael Jackson- Disney version of St. Peters, is spiritual home for Cao dai, surely a freaky religion developed on earth in 1926 by a Vietnamese monk who wanted to bring everyone together. To join this “faith” takes a whole bunch of doing, and giving up, and kneeling on hard ornate floors four times in a 24 hour period. Among dragons, snakes, unicorns, turtles and left eyes, one has to progress up nine steps or levels, and in normal circumstances, it takes ten years per steps (yes, it’s best to be born into this faith) to be able to become a “leader” (priest). You can rev it up by being generous or doing something to advance the religion. 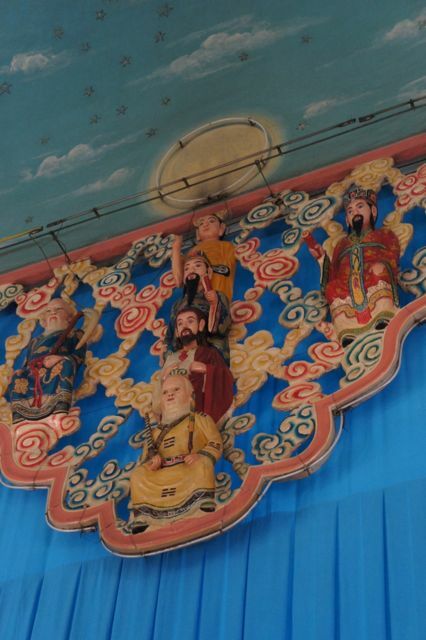 This “religion” combines Buddhism, Hinduism, Daoism, Confucianism, and Christianity (although a figure of Jesus is crunched kind of secondarily in between Buddha and Confucius) to be uniquely Vietnamese. Women and men wear thin white cotton attire. But, on the good side, the belief is in one God of all and it is the God of Christian faith, influenced by the French presence in the 1920s. The French brought Christianity to Vietnam. But preceding God was the Dao or the Way as believed by the Daoists. And they think Jesus was like a Buddha, an enlightened being sent to help us. Lord we need help! m` And the religion is structured around priests, bishops, cardinals and a pope (“the leader”), all with Vietnamese names. It stresses three hierarchal positions: Buddha (the highest attainment of teaching and faith), Sage and Saint. It is supposed to believe in equality of sexes - but in the services, women are on one side and men on the other. Also burials are preformed on the balcony while services are underway. And there are guards outside who won’t let people or cars pass in front of the while the service happens. All must remove shoes on the street and walk on a thin “carpet.” Hey, Ben - it’s colorful!!! I do believe we should all be on the same page. Maybe Cao Dai is the beginning. It is growing by leaps and bounds in this country, but seems Cultish to me. I didn’t feel comfortable within its walls. I’m one hundred per cent for Jesus. If you don’t have a queasy stomach, you must visit the War Remnants Museum. It takes your breath away in the horror displayed for all to view through photographs, and also giving homage to the photographers who recorded the Vietnam War in all its disasters. 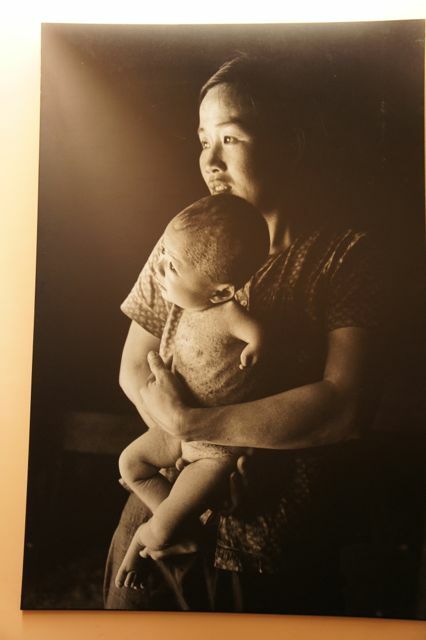 Two Japanese photographers, Bunyo Ishikawa and Nakamura Goro, are also featured and the unbearable “Requiem” room is a collection of war documentary photos taken by 134 journalists who were killed during the Indochina wars. This museum, 3 floors, well laid out with identification in both English and Vietnamese, thank you, opened in 1975, when things were still fresh. In its truth, it definitely puts the horrors of the aftermath of Agent Orange in focus, since that affected children born to those who were victims of it. Lots of atrocities on the side of the GI are shown, not so much those on the part of the Viet Cong, which surely happened. 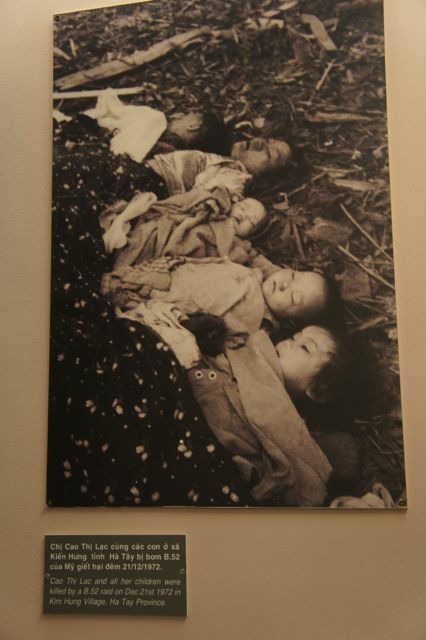 The My Lai massacre is also covered. I must remember, we, who were trying to help the French and the South Vietnamese and had no reason to risk lives of our men and women, were the bad guys. Outside, like captured booty, are parked tanks and guns and airplanes of the American forces (part of the 130 billion dollars the US government spent on this unpopular war,) like a 175mm cannon, an M-48 tank, and the Huey helicopter. The whole experience is very anti--American, so much so, my guide didn’t think I could stomach it. Pictures of mothers and babies and distorted children are major and so atrocious it seems an invention by some artist, not truth. Did we know these things would result from the uses of napalm and Agent Orange? 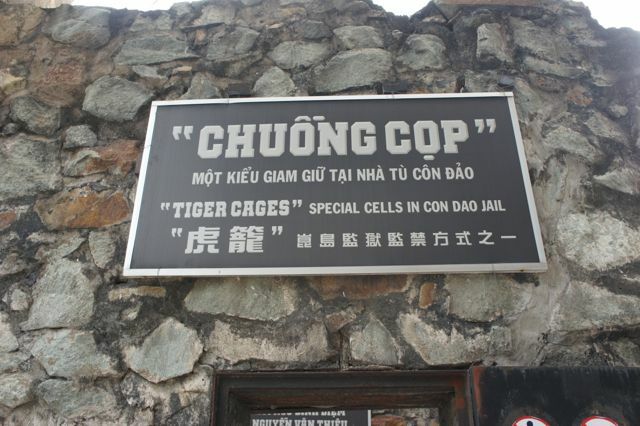 Outside there is also a replica of the famous Tiger Cages at Chuong Cop ( a jail run by US) where prisoners were entombed, and other scenery that confirms war is hell. I’m sure these kinds of things happen in any war zone by any nation against another with a cause to defend. War is not an answer because the innocent suffer, and our young men and women, who are doing the right thing, defending God and country and family, lose too many parts, too much of their sanity and heart, and see more than any person’s mind can experience. Can we come up with a better solution to conflict? Please, bomb-waving leaders and extremists, think because once you are dead, there is no more for you or others eliminated but hope of heaven. Robert S. McNamara wrote in his memories of the Vietnam years, “Yet we were wrong, terribly wrong. We owe it to future generations to explain why.” Have we? To lighten up a very heavy day of emotions, Jade, our cheerful, knowledgeable and honest guide, took us to a tea house where I was able to get wild and unusual teas for Thistle Farms new tea house. Of course we had to sample. Ladies in the red “ao dai” silk dresses served us samples from their stock of lotus tea, expensive green teas and milk tea (tea brewed in milk). 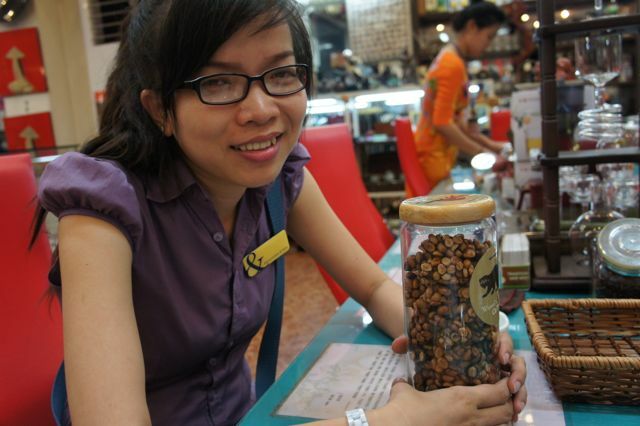 There also was a wierd coffee from Vietnam fields stored in weasel poop. I promise. 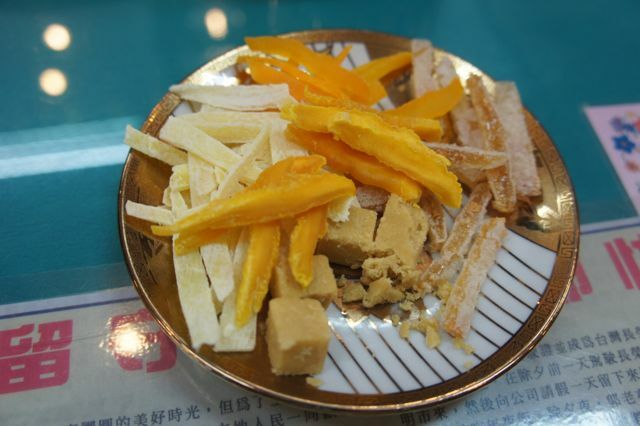 The women also offered samples of snacks from ginger, sour dried mango, sweet dried mango, coconut candy, and other Vietnam specialities. it helped to come back to where we are today in this world, trying, one hopes, to convince our modern generation that friendship and trust might prevent another Vietnam. Another amazing blog! This one is an unbelievable history lesson about Vietnam. 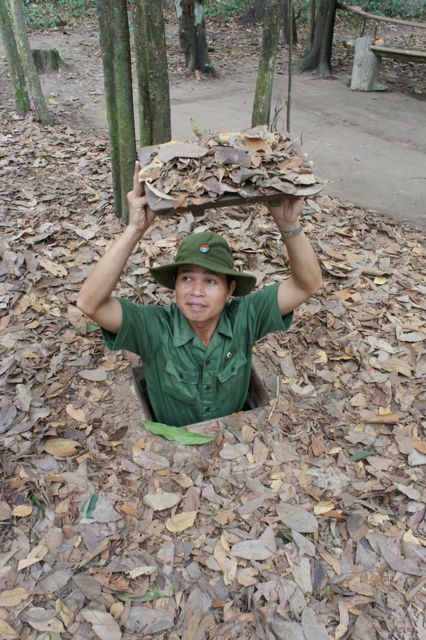 We've never heard of the Cu Chi Tunnels and the underground city until now. More than likely, very few in America know anything about the relatively new Vietnamese religion that tries to bring all religions together. 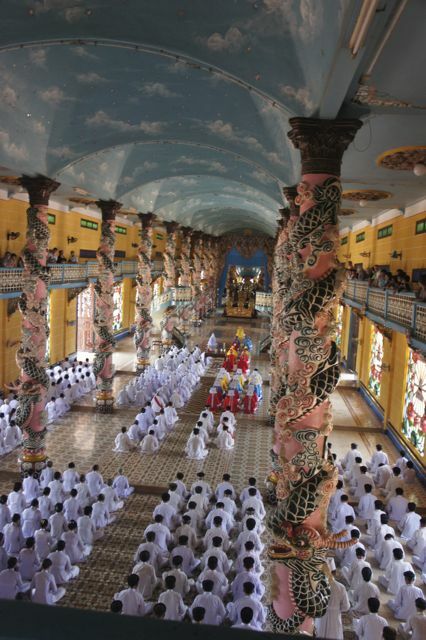 The Cao Dai Temple is unique and beautiful. We've asked this question before. Since you are constantly on the go every day, when do you find time to learn so much about the areas you are visiting and to put everything you've learned in your blogs? You must have a photographic memory and obviously, you never sleep. The "Energizer Bunny" Award you received in California earlier this year could not have possibly gone to a more deserving recipient!